Prototype: Two-axle beer refrigerator car with a high mounted brakeman's stand. 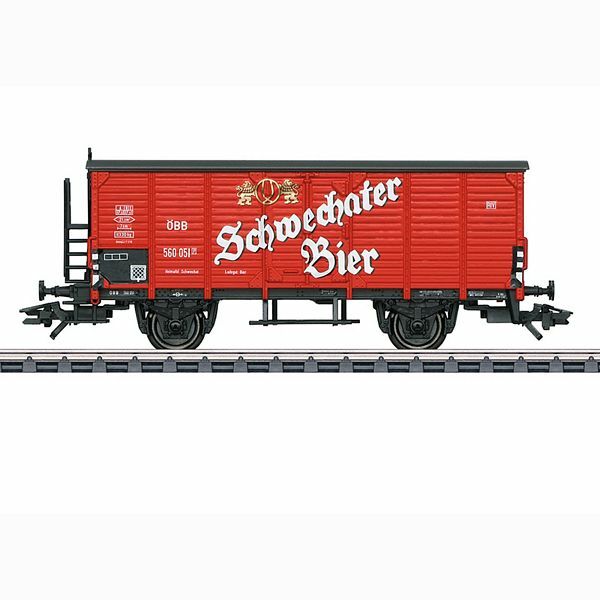 Privately owned car in the fictitious paint and lettering scheme for the brewery Schwechat in Austria, basic color of red. Used on the ÖBB / Austrian Federal Railroad. The car looks as it did in Era III, beginning of the Sixties. Model: The car has fixed cold-storage area doors and a horizontal board structure. It also has a high mounted brakeman's stand. Length over the buffers approximately 10.6 cm / 4-3/16". DC wheelset E700270. Striking red paint scheme included.